Written by goenKendama on June 8, 2014 . Well you have a new kendama, now what? If you’ve already gone through our article, How to pick your first kendama, then you are ready for the next stage. Here are some tips for kendama preparation prior to playing. If you start playing with your new kendama you will notice that the tip of the ken starts to get beaten down. It’s the nature of the beast especially when trying new spike tricks. Some of our practice kendama at the shop have been worn flat by all the use. That requires reshaping the tip and if you have to do that often your kensaki will get shorter. So the first order of business is to superglue the tip to make it stronger and more resistant to blunting. (Check out our video: How to prep & glue a kendama tip ) Glue the tip prior to any treatment like beeswax or oil to make it more effective. Because it is now harder it also means that missed spikes will often leave more of an impression on the tama which is generally not a big deal. We recommend 2 coats of the non-gel type of super glue because it soaks into the wood better. Preferences vary here but usually we run it down to cover the entire cone of the tip just short of going over the shoulder of the point. Just make sure you don’t leave any rough spots. If you do just sand it down until it’s smooth. After you’ve used it for a while you will probably notice that the very tip starts to crack and turn white. Hit it with another drop of glue and you’re good to go. If you are right-handed then you will be already set for play since most kendama come setup for right-handers. If however you are a lefty then you need to change the string location on the kendama to facilitate play for a left-hander. 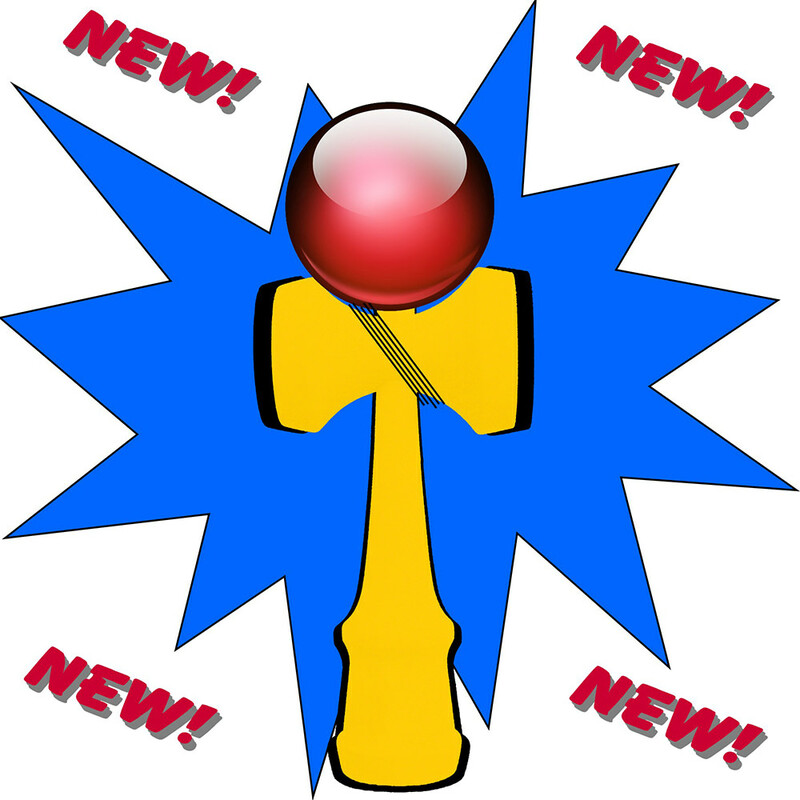 Check out the video: How to change a kendama from right-handed to left-handed play. Every kendama is different and the finish of the hole in the tama can be smooth or considerably less so. If you run your finger around the ramp leading to the hole and the hole itself and feel rough spots take some fine grit sandpaper or a rotary tool like a Dremel tool and sand the rough areas. Take off as little material as possible. Additionally you can put a little talcum powder on the ramp and in the hole to smooth it a bit as well just make sure you don’t get any on the cups or tama since it will make balance tricks even harder. If you find the bead end jumping out of the tama during tricks try the JKA suggested method of tying a double knot about 2-3cm above the tama. This method allows the string to untwist more easily as you play. Just remember to take into account the string length lost because of the knot. Alternatively we’ve seen people just stuff a piece of paper or aluminum foil into the tama hole but this will freeze the bead and string and lead to more tangles so it’s not ideal. Remember you don’t want anything permanent in case you need to change the string. Though there is no particular restriction on string length the JKA suggests string lengths from 38cm-40cm for optimum playability. (They also advise that 35cm might be better for some children.) 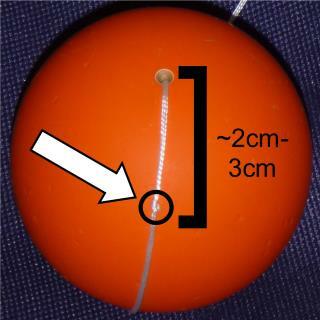 A way to quickly check your string length is the “two finger” method. Place the tama on the ken and place two fingers in the loop that hangs below the chuzara (base cup). 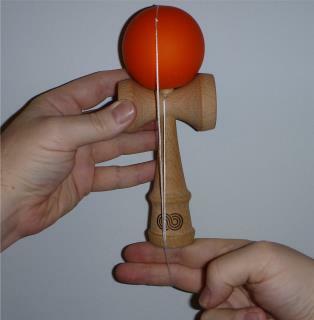 Many kendama come with string long enough to put 3-4 fingers below the chuzara so you may have to shorten it to fit your preference. We’ve had a number of people ask how to “break-in” a kendama. Basically just playing will break it in although lots and lots of Moshikame and spike practice will accelerate it somewhat. Some players like to customize their kendama for fun or to make them more identifiable in a crowd. There are colored strings available that are easy to change to add a little bling. (this video includes how to change the string) We also have players that will paint or draw on their kendama to make them unique. Understand however that most standard paint won’t hold up to hard play as well as the original paint. So now your kendama is ready to play. What’s next? Check out our article: Start Playing:an intro into kendama play.